This 4-bedroom villa for up to 8 guests is located in Albufeira Centre and has a private swimming pool. 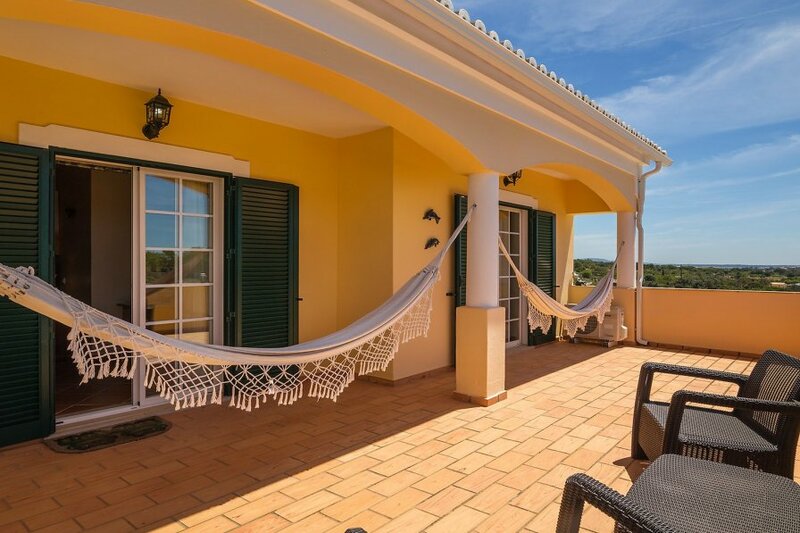 5 km from Albufeira: Beautiful, cosy, comfortable villa Monte Velho, 2 storeys. In the resort Mosqueira, in a quiet position, 5 km from the beach, in the countryside. Private: property 2'982 m2 (fenced) with lawn 800 m2, trees, beautiful garden to relax, courtyard, swimming pool angular (9 x 5 m, depth 90 - 230 cm, 01.05.-31.10.). Outdoor shower, table tennis, terrace, garden furniture, barbecue (slide, swing), petting farm. In the house: WiFi, table football, washing machine. Room cleaning daily on request (extra). House maid on request (extra). Cook on request (extra). Pre-arrival grocery service. Airport transfer (extra). Parking (for 3 cars). Shop 4.2 km, grocery 4.2 km, supermarket 4.2 km, restaurant 4.2 km, bar 4.2 km, bakery 4.2 km, cafe 4.2 km, internet cafe 4.2 km, pub garden 4.2 km, sandy beach Falesia Albufeira 6.9 km. Golf course (9 hole) 5.8 km. Nearby attractions: Zoomarine 14.8 km, Slide e Splash 30.6 km, Fiesa 13 km, Aqualand 15.6 km, Algarve Shooping 7.3 km, Marina de Albufeira 8.7 km. Please note: car recommended. Groups of teenagers on request only. The owner lives on the same property.